Women grieve during the burial of seven miners, victims of a collapsed mine, at the Ntunga public cemetery in Rwamagana, eastern Rwanda, Jan. 22, 2019. 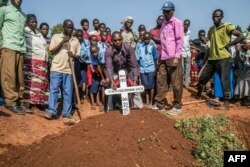 Mourners place a cross on the grave of Uwiringiyimana Gadi, 22, a victim of a collapsed mine, at the Ntunga public cemetery in Rwamagana, eastern Rwanda, on Jan. 22, 2019. Eugene Uwimana reports for VOA's English to Africa Service.